Free Shipping Included! CB Gift Heartfelt Collection Framed Table Clock with Sentiment, 7'' x 9'', White by CB Gift at Rossetti Productions. MPN: B3219. Hurry! Limited time offer. Offer valid only while supplies last. A thoughtful gift that is ideal for friends, family, and loved ones the framed table clock is designed to bring a restorative feel to your decor. A thoughtful gift that is ideal for friends, family, and loved ones the framed table clock is designed to bring a restorative feel to your decor. Each 7x9-inch clock frame features classic and simple architecture detail with corbels, brass numerals and black hands that are beautifully set off by the White stained wooden frame and slightly distressed finish. A coordinating silver toned metal clip mounts a sentiment on antiqued, heavy-weight paper with photo mount corners. The appropriate sentiment in black type print reads: 50th anniversary blessing, may you celebrate this milestone with Peace, love and joy. -Grace and Peace be multiplied to you... -2 Peter 1: 2. All sentiments are removable and easily replaced with a 6x4-inch photograph of your choice. Each clock Arrives gift boxed, and requires a 1AA battery (not included) Clocks come with an attached easel and are easy to hang as wall decor in a collage or as a stand alone piece. An ideal gift for anniversaries, holidays, birthdays, congratulations or just because. 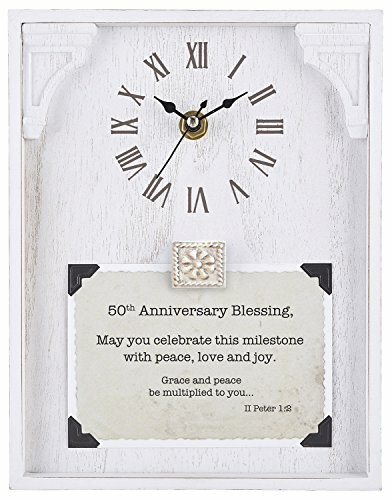 Be sure to look for more framed tabletop Clocks in natural or White finish; including sentiments for pastors wife, anniversary, faith, teacher, in memory and many more. Writer and designer the Scottsdale Series an metts is all about capturing those special moments that we want to remember forever, tying snapshots of memorable moments, with a functional clock is the essence of this collection from heartfelt at creative brands. Creative brands focuses on gifts that will be a source of inspiration, fun, and encouragement to all with an emphasis on quality and value for our customers. Whether for special occasions, Social expression, or just for fun, creative brands has a solution for the ever-changing needs of our customers.